Would you like to have the best deck in the neighborhood? 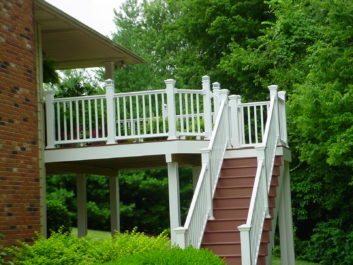 If so, then call on Bethalto, Illinois’s best deck builder: Chesley Fence & Deck. Since our founding in 1967, we have strived for perfection, making sure to provide only the best to all of our customers, whether it be products, installation, or service. In fact, it is thanks, in part, to our determination to settle only for excellence in everything that we do that we continue to maintain an A+ rating with the Better Business Bureau. Quality decking products are only part of what makes a deck the best. Without a proper installation, even the most premier decking will not look or perform as it should. That is why we have a team of highly trained and experienced technicians who will build your deck flawlessly from the ground up. Their work is even backed by a three-year labor warranty for your peace of mind. To learn more about how we can help you achieve the best deck imaginable, contact Chesley Fence & Deck today. We are proud to serve all residents of Bethalto, IL and neighboring communities.